click on the link in the product description below. Standard V-Pro dimmers have a push-on/push-off switch action with rotary dimming. You can change the driving modes and adjust the minimum brightness with pushes of the dimmer control and using signals from the lamps. You can view the programming instructions on the dimmer leaflet or, alternatively, you can view Varilight video on YouTube using this link:- https://www.youtube.com/watch?v=Id1E2hQpX-w . V-Pro series dimmers are designed for use with LEDs and they are also suitable for halogen and incandescent lighting, most dimmable electronic transformers and with no minimum load, are suitable for dimmable low energy lighting. The V-Pro Series, eliminates Dimmer Buzz For GLS Bulbs, GU10 Lamps, and LV Transformers Including Trailing Edge Loads and is equipped with Self Re-setting Overload Protection, so is able to handle overload situations, for example, if the wattage of the bulbs/lamps are accidentally too high on a circuit. This is achieved by the dimmer cutting out before there is any damage, (if the watts are grossly overloaded), until the load is reduced. The dimmer also contains a heat sensor which again stops damage to the dimmer, if it becomes too hot. Please adhere to maximum rating listed on the Varilight datasheets on their website or copy and paste the link for the V-Pro instruction leaflet: – http://www.varilight.co.uk/leaflets/VARILIGHT%20V-Pro%20Dimmer%20Instructions%20776.pdf .These dimmers do not work with lighting panels (LED or CFL) and are not suitable for wire-wound “toroidal” transformers. Please note that only good quality dimmable LEDs should be used. 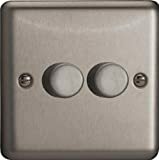 If this dimmer is purchased and the LED lamps are not compatible, the dimmer is not faulty so cannot be returned, but a better quality LED lamp/bulb should be fitted instead. Trailing and Leading Edge Dimmer, please refer to instructions provided with the dimmer, which explains all 3 dimming modes. Great Ideas Electronic Excercise Ab Toning Pads. EMS to Firm Glutes and Stomach. Relieve Muscle Pain With Tens. This entry was posted in Buy Supplements and tagged Chrome, Classic, Dimmer, Edge, Gang, Matt, Switch, Trailing, Varilight, VPro by TOSMS. Bookmark the permalink.